There’s just something about a bathroom, am I right? Okay, you may not look at restrooms with the same enthusiasm that I do, but sometimes the amount of planning that goes in to disguising the bathrooms in the parks and resorts astound me. Of all the signs, names, and little details that I could be talking about from Disneyland and Disney California Adventure this week, I had to pull out this little beauty. This Disney California Adventure restroom sits in Hollywoodland, tucked away between Disney Junior – Live on Stage and the Off the Page shop, and is most often used as the stroller parking area for the Disney Junior show. There aren’t a lot of toddlers that I know of that are well versed in architectural styling, and most of their parents are probably looking down and just trying to get their little ones into the next showing. It’s truly a shame too, because there is a lot that gets covered up or overlooked when you pause here for just a moment. For those of us who have taken that moment, it’s clear that this restroom is built upon the foundation of Frank Lloyd Wright’s body of work. Considering the amount of influence Wright had on architecture, in southern California in particular, it’s no wonder he was given his own nod in Hollywoodland. The restroom isn’t specifically modeled after one of Wright’s works, but rather the overarching style he created. 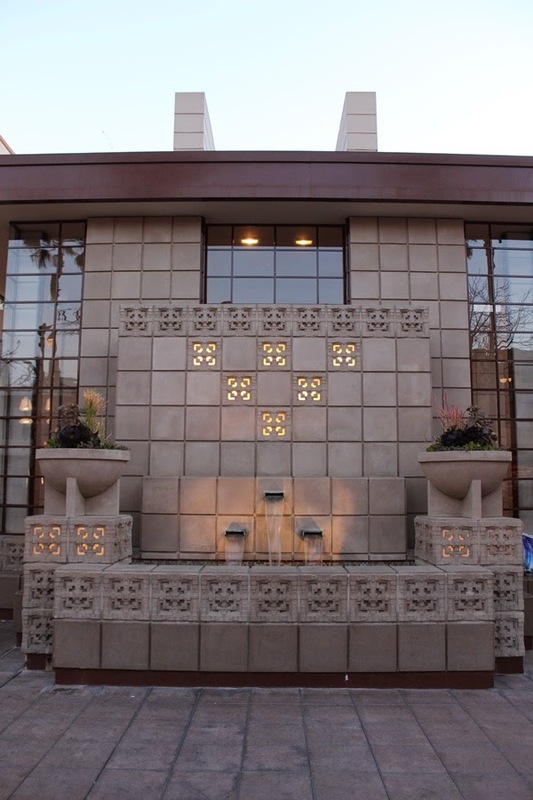 The blocks, patterns, water features, and protrusion all have their place in places light the Millard House in Pasadena, Freeman House in Hollywood, and the Ennis House in Los Feliz. Placemaking is one of the founding principles of Imagineering, whether we are looking at the feel of an entire land, the story of a single attraction, or just making sure the illusion isn’t broken by the passing glance guests give to the bathroom that they are walking into. That extra mile can make all the difference, and there is no better example that the Wright restroom.